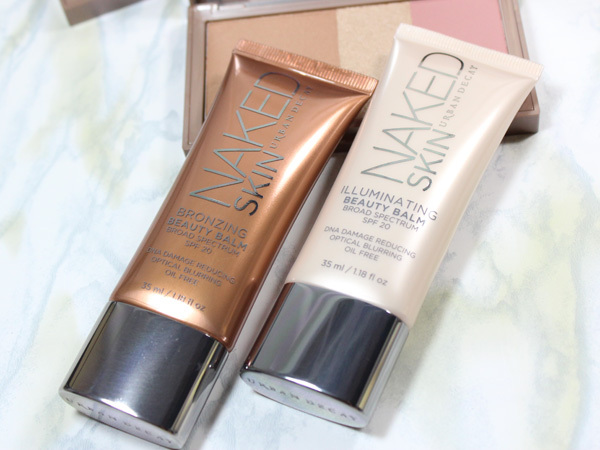 Urban Decay *NEW* NAKED Flushed + NAKED Skin Beauty Balm. When accenting a summer glow, you need more than bronzer; you need the right blush plus a highlighter to complete the look. Urban Decay has it all packaged up for you in its NAKED Flushed cheek palettes. Now, they originally had the NAKED Flushed palette, but they released three more palettes in a range of shades that are great for a variety of skin tones. 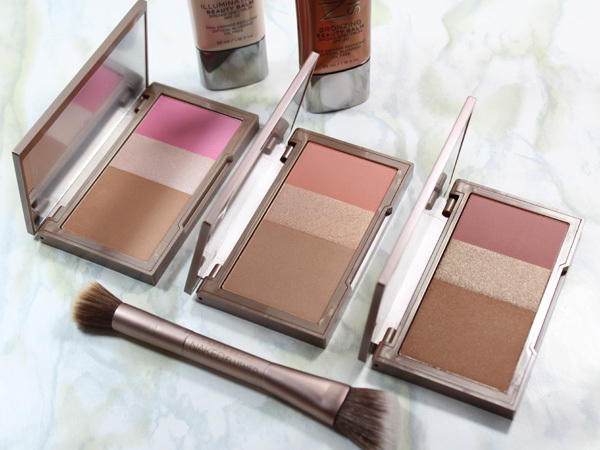 Best yet, they are perfectly coordinated - the bronzer, blush and highlighter. The three new NAKED Flushed palettes, Native, Streak, and Strip. Basically Native is Pink, Streak is Coral and Strip is Mauve. This palette features a brighter pink blush that adds a beautiful pop of pink to cheeks and I've been wearing this one at night. The bronzer is a medium bronze with a bit of shimmer and the highlighter features a pale pink shimmer. This palette is my favorite with a coral blush that looks really natural with a tan and the matte bronzer too. I really like the shimmery peach highlighter too, and I'm usually not so big on shimmery highlighters but this one is great. This palette is for the darker complexions with a mauve blush, a deep bronzer with shimmer and a very shimmery golden highlighter. It's easy to apply the shades with the Flushed Double Ended Brush, which I highly recommend. The contoured side is great for the bronzer and I like the flat side for dusting on the pop of color of blush to my cheeks. For a quick look, I have been using NAKED Flushed over NAKED Skin Bronzing Beauty Balm. This beauty balm adds a bronze shade to skin and radiance all while blurring imperfections. It's so simple for summer! If you like a bit more radiance, try the new Naked Skin Illuminating Beauty Balm. I need more coverage can't really wear it on its own, but under foundation when I want more radiance, it acts like a primer, and I really like the finished look. Both of these Beauty Balms contain SPF 20, an added benefit. Shop for NAKED Flushed and NAKED Skin at urbandecay.com, Sephora and select Macy's.